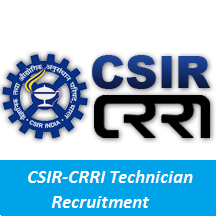 Exact details about the CSIR-CRRI Technician Recruitment 2019 Notification are available on this page. Furthermore, the officials of the CSIR-Central Road Research Institute (CRRI) had initiated this CRRI Notification 2019 for the 26 Technician Vacancies. Interested candidates can start applying online from 16th April 2019. Well, aspirants can observe the direct link at the end that refers you to download the www.crridom.gov.in Jobs 2019. Whoever has much interest to settle as a Technical Assistant they can stick on to get the information related on CSIR-Central Road Research Institute Advertisement 2019. Remember, that you have to submit the Application Form on or before the last date that is 16th April 2019. In the below sections, candidates can get more information about the CSIR-CRRI Job Openings 2019 such as post-wise vacancies, educational qualification, age limit, salary, selections process, application fee, important dates, application form and set of instructions to apply. In the below sections, we had given the details on Post-Wise Vacancies For www.crridom.gov.in Jobs 2019 along with their count. T-01 Electronics: SSC/10th Standard with Science subjects with 55% marks plus ITI Certificate in Electronics Mechanic or National/State trade certificate in Electronics Mechanic or two years full time experience as an apprentice trainee from a recognized Institution in the aforesaid trade. T- 02 Instrumentation: SSC/10th Standard with Science subjects with 55% marks plus ITI Certificate in Instrument Mechanic or National/State trade certificate in Instrument Mechanic or two years full time experience as an apprentice trainee from a recognized Institution in the aforesaid trade. T-03 Mechanical: SSC/10th Standard with Science subjects with 55% marks plus ITI Certificate in Mechanic Industrial Electronics/Mechanic Machine Tools Maintenance or National/State trade certificate in Mechanic Industrial Electronics/Mechanic Machine Tools. Maintenance or two years full time experience as an apprentice trainee from a recognized Institution in the aforesaid trade. in Electrician or National/State trade certificate in Electrician or two years full time experience as an apprentice trainee from a recognized Institution in the aforesaid trade. T-05 Computer: SSC/10th Standard with Science subjects with 55% marks plus ITI Certificate in Computer Operator and Programming Assistant or National/State trade certificate in Computer Operator and Programming Assistant or two years full time experience as an apprentice trainee from a recognized Institution in the aforesaid trade. T-06 Carpenter: SSC/10th Standard with Science subjects with 55% marks plus ITI Certificate in Carpenter or National/State trade certificate in Carpenter or two years full time experience as an apprentice trainee from a recognized Institution in the aforesaid trade. T-07 Library and Information Science: SSC/10th Standard with Science subjects with 55% marks plus ITI Certificate in Library and Information Science or National/State trade certificate in Library and Information Science or two years full time experience as an apprentice trainee from a recognized Institution in the aforesaid trade i.e. Library and Information Science. T-08 Civil: SSC/10th Standard with Science subjects with 55% marks plus ITI Certificate in Draftsmen (Civil)/Civil Engineering Assistant trade or National/State trade certificate in the aforesaid trade or two years full time experience as an apprentice trainee from a recognized Institution in aforesaid trades. TA-01 Electronics: 1st class Diploma in Electronics Engineering/Tech. of at least 3 years full time duration or at least 2 years full time duration in case of lateral admission in Diploma courses or it’s equivalent with experience of 2 years in the relevant area/field. TA-02 Mechanical: 1st class Diploma in Mechanical Engineering /Tech. of at least 3 years full time duration or at least 2 years full time duration in case of lateral admission in Diploma courses or it’s equivalent with experience of 2 years in the relevant area/field. TA-03 Electrical: 1st class Diploma in Electrical Engineering/Tech. of at least 3 years full time duration or at least 2 years full time duration in case of lateral admission in Diploma courses or it’s equivalent with experience of 2 years in the relevant area/field. TA-04 Computer: 1st class Diploma in Computer Engineering/Tech. of at least 3 years full time duration or at least 2 years full time duration in case of lateral admission in Diploma courses or it’s equivalent with experience of 2 years in the relevant area/field. TA-05 Hotel Management: 1st class Diploma in Hotel Management of at least 3 years full time duration or at least 2 years full time duration in case of lateral admission in Diploma courses or it’s equivalent with experience of 2 years in the relevant area/field. TA-06 Library Science: 1st class B.Sc (Sci.) with B.Lib. Sci. TA-07 Civil Engineering: 1st class Diploma in Civil Engineering of at least 3 years full time duration or at least 2 years full time duration in case of lateral admission in Diploma courses or it’s equivalent with experience of 2 years in the relevant area/field. The higher authorities will specify the selection process to select the candidates for CSIR-CRRI Technician Recruitment 2019. Initially, applicants have to visit the official site of CSIR-Central Road Research Institute (CRRI) that is www.crridom.gov.in. In that go to HRD Section. Again go to Recruitment section. In that search for the blinking link of CSIR-CRRI Technician Recruitment 2019. Read and download the complete CSIR-CRRI Technician Recruitment 2019 Notification. If you are eligible, then apply either online CSIR-CRRI Technician Recruitment 2019 application form. Take two or more copies of CSIR-CRRI Technician Recruitment 2019 application form. Candidates can keep following our site that is Sarkari Recruitment for more fresh and latest updates.